Have you ever argued with a tenant about their security refund? The Security Deposit Settlement Statement gives you the opportunity to professionally itemize deductions and charges you need to make against a security deposit. It has a section that lets the tenant know the property was video taped prior to move-in and immediately following move-out. That evidence is very difficult for the tenant to argue with. The tenants rarely question the form because they know that you've covered yourself well. Repairs, cleaning, lease violations, past due charges are all legitimate deductions you should make. Sometimes, the Security Deposit Settlement Statement turns out to be a bill to the tenants for a balance due! Keep in mind that most states require the Security Deposit Settlement Statement or refund to be delivered to the tenant within a specific time-frame. Check The Security Deposit Return Time Chart to see if there is any time limit in your state. The Security Deposit Settlement Statement may be used with or without a Move-In/Out Property Condition Inspection Report. This form alone has enabled us to make valid deductions and charges (saving us tens of thousands of dollars in damage costs over the years) from security deposits without a hassle from the tenants. Don't get me wrong, we are not out to unjustly take security money from tenants! 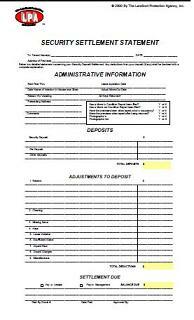 But when deductions need to be made, this form can be a miracle worker. Why? Because it itemizes valid deductions on paper in black and white and now becomes much more difficult for your former tenant to argue with the facts. No more arguing with tenants about their security refund! In the past we've all made some real bloopers of mistakes. How about one of the most common mistakes that many landlords still do all the time and haven't yet found a better way? Yes, the mistake of meeting with the tenant for a walk through* to check the condition of the property and then hand over the security deposit. Often, there is a disagreement over whether the damages were the tenants fault or responsibility, right? Have you ever been in the awkward position of meeting with the tenant for a walk through and the tenant expects all of his security back when the tenant is a slob and did extensive damage? Do you tell them that they are slobs? Many landlords are glad just to see the tenants leave so they can clean up the property and get better tenants next time. How often do you walk away from that meeting feeling disappointed? Never again meet with the tenants for a walk through to refund their security and pick up the keys! (Unless you have decided that you want to give a full refund no matter what.) Have a spare set, or have them return the keys to you. Let your tenants know that since many damages occur during move-out, you always have the property inspected after the tenants have moved. Their security will be sent to the forwarding address they gave you on their * Notice to Vacate. They will want to do their best to leave the premises in good enough condition to get their security refund. So when they give notice to vacate, send them a * Move-out Reminder letter. This explains what tasks they can do to have the rental ready for the next tenants. In the event our findings are ever challenged by the tenant, don't forget to use Essential Form: Security Settlement Challenge Crusher. This is a powerful Landlord Protection tool that should be used every time a tenant vacates.